The top wedding introduction songs vary each year based on current popular bands and artists, wedding trends, and the preferences of the happy couple. By knowing how best to use introduction songs and how to choose one to suit the mood of the event, however, a couple can use this music to introduce a great time to all their guests. With so many details that need to be planned for a coordinated wedding, many couples question the need for specialized introduction songs. Depending on how the bridal party and the newlyweds will be introduced at the wedding reception, no dedicated song may be necessary. For example, couples who opt for a traditional receiving line may have no need to be introduced, but most couples do like to make a grand entrance. Furthermore, if many guests are unfamiliar with the wedding party, an introduction song presents them to the entire crowd at once rather than requiring many introductions throughout the evening. Wedding introduction songs can be used in several ways. A song may provide background music as the entire bridal party is introduced to the assembled guests, or it may be played only as the bride and groom enter the reception. The DJ or other individual in charge of music should adjust the song's volume so the names of the bridal party members are clearly audible, and the volume can be increased with the applause for each participant. Generally, the youngest members of the wedding party are introduced first, followed by the groomsmen and bridesmaids in the wedding processional order (often as pairs to save time), finishing with the maid of honor and best man just before the happy couple makes their appearance. In most musical introductions, no other family members or guests who are not in the wedding party are included. A couple can also ask their DJ or hired musicians for suggested songs. Some vendors will have only a limited selection that couples must choose from, while others will be willing to work with any song the couple wishes. This list is only a fraction of the best wedding introduction songs available; for a couple to truly introduce themselves and their wedding party in a memorable way, they should choose a song that is meaningful to their celebration. The first consideration for a wedding introduction song is whether or not it is meaningful to the couple. Most introduction songs are more upbeat and energetic than typical romantic tunes - the first dance, father and daughter or mother and son dance, and last dance are almost always romantic, and the introductions can be made on more fun, active notes. This leaves many options for the couple to choose from - popular radio songs, movie or television theme songs, or any tune they enjoy can be used as an introduction. There are several considerations to be aware of, however. 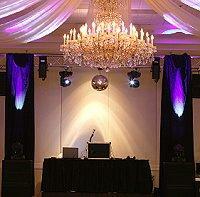 The song's length should work well for the size of the wedding party, without too many delays or rushing introductions. Generally speaking, a three minute song is sufficient for most wedding parties. The lyrics should be inoffensive to guests. The song should set the mood for the event - a slower song is best for a more formal wedding, while a tropical or island beat song may be perfect for a beach wedding and a country song may be ideal for a western wedding theme. Even with these considerations in mind, there are hundreds of potential introduction songs a couple can choose to kick off their wedding reception festivities. The top wedding introduction songs for one couple may be at the bottom of the list for another couple, but the great thing about this piece of music is that the couple can choose whatever fun songs are meaningful to them. With the proper choice, not only will the song be a great way to start the reception party, but it will become part of many happy memories.